After my son saw me troubleshooting a circuit with my multimeter, he wanted to use it himself. Now while I strongly believe that kids should have access to real tools, that doesn’t mean they have to be my tools (you should see what he did to my dial indicator). Auto-ranging. The kiddo isn’t reading resistor values yet, so plug and play is the way to go. Auto-shutoff. I guarantee it will be left on after use. Durability. It has to withstand the bumps and drops that it’s more likely to get from small hands than large ones. Affordability. In case it’s not durable enough. The Equus 3320 multimeter fits the bill on all counts, ringing up at right around $20. Considering that it’s not a toy and can continue to be used for decades, it seemed worth it. Most of my son’s electronic projects are with his Snap Circuits kit, and he doesn’t have the dexterity to hold the two regular probes on the circuits while at the same time manipulating switches and shining flashlights into photoresistors. Heck, I couldn’t do it either. 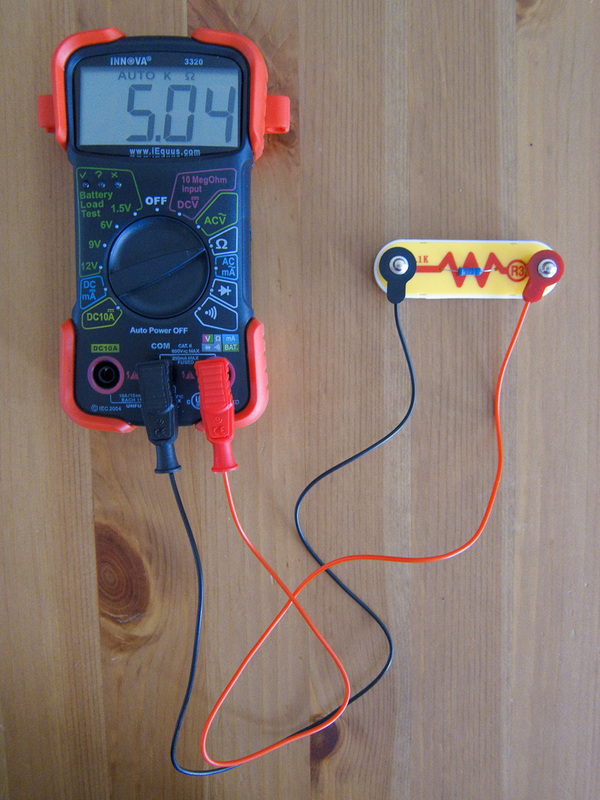 The multimeter would need snaps for probes. Not surprisingly, these are not standard equipment for electronic testing. 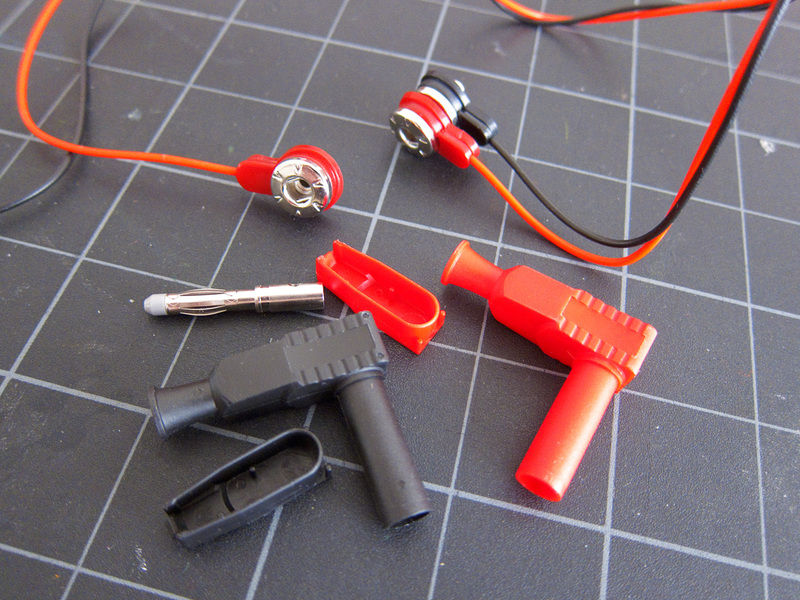 So, with a set of sheathed banana plugs and a pair of replacement jumper wires from Snap Circuits, I made my own. This hardly needs instructions, but I’ll write up the steps anyway. First, disassemble the banana plugs. 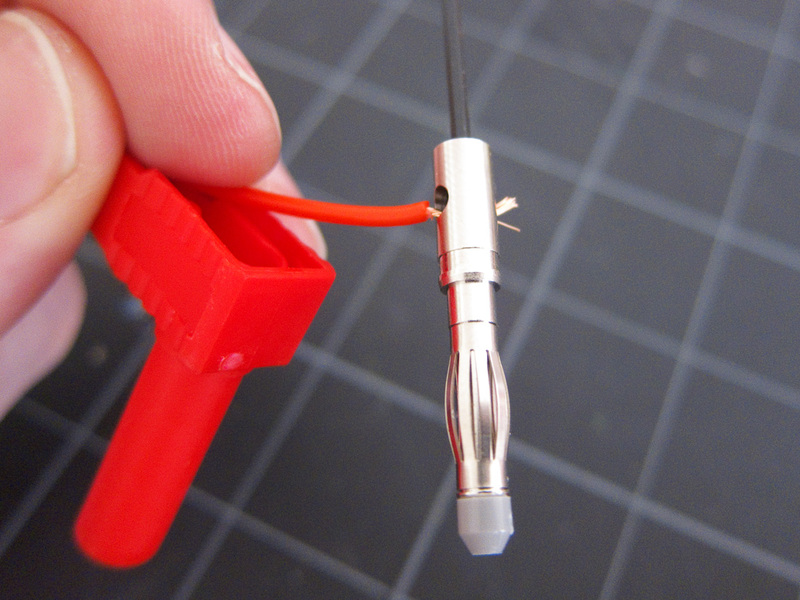 Cut off one end of each Snap Circuits jumper wire and strip half an inch of wire from the long wire remaining. Instead of cutting the wire as close as possible to the snap, you might want to cut it with about an inch of wire remaining on the short end. This way those snaps can be spliced to something else (alligator clips?) and re-used. Insert the stripped end of the wire into the housing for the banana plug, into the plug itself, and then tighten with the included Allen wrench to clamp it in place. Assemble and snap the back into place. That’s it. Put the original probes aside to use later, and start testing! Some fun things to do include seeing how precise the marked values on the resistors are, testing continuity, measuring the resistance of different chains of components, and measuring the current draw of various circuits. Seeing the numbers on the meter change as he turns a potentiometer or adds a light bulb to a circuit really makes concepts come to life. Another great thing about the snap probes is that they’re a lot harder to misuse when a budding engineer decides he wants measure the voltage of a wall outlet or the resistance of an iPhone charging port. They just won’t fit!